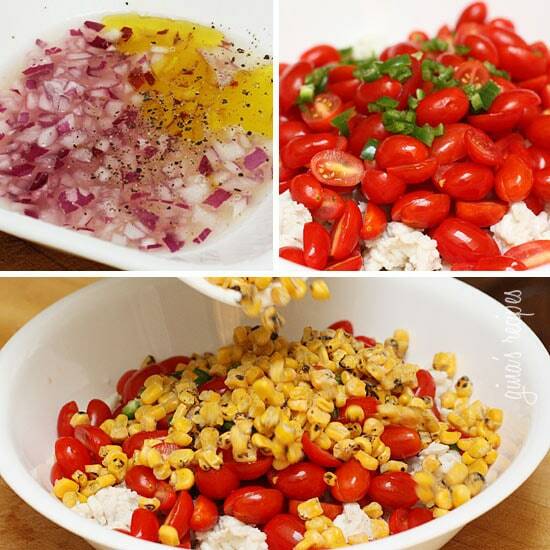 A wonderful summer salad made with lump crab meat, summer tomatoes, sweet charred roasted corn, cilantro, hot peppers and zesty lime juice. Serve this over mixed greens or tostadas as a main dish or you can put this in martini glasses as a fancy appetizer. This is perfect to bring to a potluck, or you can halve the recipe for less servings. Fresh crab is always best but if that’s not available near you, canned lump crab would do. For the corn, you can roast the corn on the grill, or if you are lucky enough to live near a Trader Joe’s, they sell roasted frozen corn which is such a convenience. A good tip, if you make grilled corn on the cob often and have leftovers, cut it off the cob and freeze it! Let them marinate at least 5 minutes to mellow the flavor of the onion. 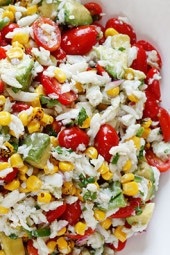 In a large bowl combine chopped crab meat, avocado, tomatoes, hot pepper and corn. Adjust lime juice, salt and pepper to taste. Don’t be cheap and get the imitation crab. Get the real stuff. It went from 2 points to 4. Added diced radish and cucumber for a different crunch and topped with a little pepper flake instead of the jalapeño. Tastes FANTASTIC! I made this today for a picnic with friends-it was a HUGE hit! So easy to make and SO delicious! Definitely a splurge on the budget for the crab(I bought at Costco so not terribly expensive), but it was worth it!! If you can’t find roasted corn you can roast your own: heat a bit of oil in a fry pan and toss in the frozen corn. Mix while heating — it’ll brown up in no time. It’s good. I used a combination of shrimp and crab – for my taste, it needed much more salt and lime than what was called for in the recipe. Would this be considered a side dish or main dish. If it’s a side dish, what do you recommend to eat with it? This was delicious ! We will be making it again this week ! I just made this today! It’s incredible! ???? Vegetarian version: In place of crab use 1 can of rinsed chick peas (garbanzo beans). My husband and all 3 kids liked this (I used imitation crab)! I served on a tostada shell one day and on top of lettuce the next. It's a keeper! Thanks so much for this recipe, Gina! 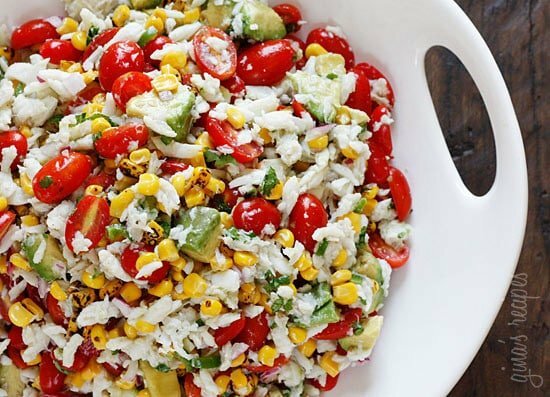 Over the years it has become THE dish that I bring to all summer barbecues, picnics and potlucks! There's never any left at the end of the day which says so much. Really looking forward to the release of your cookbook. Thanks again! Add some fish sauce and it's outstanding! I love all of your recipes, but this is definitely one f my absolute favorites! I made this today and had it for lunch with a side of trader joe's Mac n cheese balls (balance, right? Haha) and it was phenomenal. You also get such a large portion for the calories! Delicious!!! Thanks Gina! Wow, this looks great! Perfect for summer! I have tried several of your recipes, but this one is high up there! I just made this for dinner. My husband and I ate it over lettuce. Delicious!!! Thank you for your recipes! We love them! How big is the cup that you refer to in serving size? Average how many grams ??? Do you serve it alone as a meal or as a side dish with something? This is a great recipe. Even my picky husband liked it. I used heirloom tomatoes instead of grape tomatoes. I put a smoker box with wood chips on the grill when I grilled the corn. All the flavors and textures were incredible. Being from Maryland I was hesitant to use crab like this instead of in a crabcake, but it was well worth it! I made this last night using some Dungeness Crab that my hubby and I caught while on vacation in Seattle and it knocked our socks off! We left out the cilantro and raw onion (don't care for either)and it still had plenty of wonderful flavor. We served it as an appetizer and our guests were totally blown away! I love making things like this that fit in to my plan but taste great and don't scream "DIET!" to everyone else. Thanks once again Gina…you rock! My husband is allergic to corn – what would you suggest I use in place? Thanks and I LOVE your website! This is delicious! We made it using imitation crab (because that's what we had in the fridge) and it was really delicious. We ate it with baked tostada shells. A perfect summer recipe! 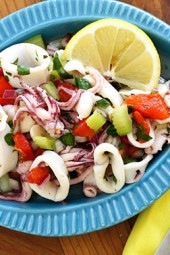 In Peru, where my Father is from, they make a dish called Ceviche that is somewhat similar to this. You use any type of white fish and the acid from the lemon/lime is what cooks the fish. I am not opposed to using crab, but was wondering what you thought or if you've tried this with fish instead? Love your recipes btw. Every one I have tried so far has been a great success! Thank you! I love ceviche! But no, I did not try it in this recipe, I'm sure it would be great! I added strained black beans instead of avocados at the last minute because avocado wasn't ripe enough. Still tasty. I made the roasted corn in the oven following Bobby Flay's recipe. I put the corn (on the husk) in the oven at 350 degrees for 30 minutes. You don't get the char that you would on the grill but the corn still tastes sweet and good. I am allergic to avocados.. Any other suggestion of something ot add in? This looks delicous! If you are allergic to avocados, try peeling, seeding and then cubing some springtime cucumbers. It adds some counterbalance to the cilantro and a little crunch. I do not like cilantro or jalapenos. Do you think this would work if I replaced with mint and green chilis? This was amazing! I added a touch of garlic powder and cumin. Muy delicioso!I will be making this all summer! I made this recipe but let the red onions soak for about 15 mins in a tbsp of white vinegar then drained completely..then continued with the recipe. Doing this really took the edge off the onions and gave it a nice tangy flavour. I served this as a topping on BBQ turkey burgers. The next day I had some for lunch in a Body Wise Wrap. 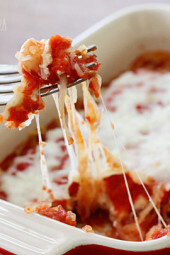 Absolutely delish…love the recipes on this site, Thanks Gina! I made this tonight and LOVED it. I used fresh corn off the cob and skipped the roasting. I also skipped the crab as I served this as a side to your Skinny Chicken Enchiladas. Summer in a bowl. Loved! I can't wait to eat the leftovers for lunch tomorrow. 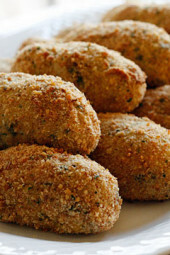 I tried this recipe and I loved it, it was a BIG hit with family and friends. Made it with shrimp instead of the crab and it was really yummy. I will be making this one again. It was very simple and really impressed my husband. Paired it with the Cheddar Biscuits. Great dinner! Delish! Planning on serving it over a bed of greens later tonight. Thanks! Made this for a potluck over the weekend and it was a hit! Oh and when u cut hot peppers, wear gloves! My fingers were burning for hours after! lol Thanks for another great recipe! OMG – made it last night and it was a HIT! Thanks so much for posting! This was really good! Thanks! I had been eyeing this recipe for days and I finally got around to making it! It was delicious and my husband loved it. We had it with Tostadas. I added 3/4 of a can of black beans and Queso Fresco on top! 🙂 Amazing. I made this tonight for dinner and it was absolutely amazing!! We ate it on super thin crackers. Thank you so much for this website and all this delicious food! 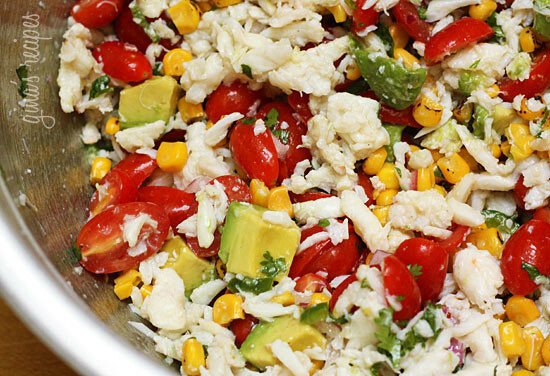 I just made this with shredded chicken instead of crab and it's fantastic! I ate it in a tortilla and it was a great lunch – I can't wait for the leftovers! Thanks for this recipe Gina! I had some canned crab meat that I've been wanting to use so I made it with that. I also ran out of avocados because I had made some guacamole, and then I thought it would be interesting to use the guac instead. So I threw some in there. The whole thing tasted good but was a bit mushy, so I decided to eat this salad on top of some whole wheat toast and it was amazing! Thanks again for all of your amazing recipes! Wondering what I can sub the corn for? I don't eat grains (corn is actually not a veggie) or legumes. This looks terrific and as amazing as all your other dishes. I was thinking of making it with shrimp. Do you know how much it would effect the points? Yes, grill the corn on the cob, then cut it off with a knife. If you like the taste of imitation crab, I think it would be great! Jane, lobster would be amazing!! Oh, this looks unbelievably good! Definitely bookmarking this! I make this same salad but sub black beans for the crab. I think I am going to try it with lobster meat this weekend. Thanks for the great recipe! I have a question – in your first pic where you've combined the onions, lime juice and olive oil…is there something else that should be added?? Reason I ask is because in the picture it looks like you've added either yellow peppers or corn…not sure which is it?? Anyway, I ask because this salad looks AMAZING and I can't wait to make it and just want to be sure I get just right and not leave ANYTHING out! 🙂 Thanks! Do you think substituting imitation crab meat would work? Or would it throw off the taste too much? This looks great!! Do you grill corn on the cob first than take it off the cob to mix in the salad? Thanks for sharing another amazing simple dish. Love it! If you want to make this in advance, don't add the avocado until you are ready to serve it. So glad you enjoyed it Princy! We made this salad tonight and it turned out superb!! I used the left over crab meat from the crab cakes I made using your crab cake recipe which was also very delicious! Thank you so much for posting these recipes, they always turn out great. You are a great cook. Beautiful!!!! Can't wait till my next BBQ or potluck!!! Last time I made the avocado black bean corn salad and I was the star of that potluck show! Rave reviews and several invites to the next luncheon….Gina, you're making me one popular girl! Not to worry, I always expose my secret weapon….skinny taste.com! This looks amazing! I love all the colors plus the different flavors and textures. is it ok to make it one day in advance? On second thought, my mouth has been watering so much after reading this recipe that I wanted to link a little love on my blog. Wish I had half your talent. Just keep those recipes coming. Another great recipe. I can't wait to try it. You've been pinned at barbara0101. Gorgeous! And perfect for summer – light, fresh, and delicious. MNjen- Are you using the Printfriendly button? Oh, that looks good! I have an overabundance of cherry tomatoes from gardne and avacado is my favorite food. Can't wait to try this! Thank you! I am not able to print any of the recipes. Does anyone know why this might be happening? This is such a fresh looking salad! Yum! I'm sure chicken would taste great too. Looks great could I use chicken? Great presentation!! I love the colors! Grilled corn has such a great flavor good idea putting that in there. I cant wait to make this for a bbq! Sara, you could make it without, but you'll have less salad, and therefore the points and serving size would change. So obviously the crab is a signature componet in this dish; but I am not a fan of crab~ would anything else work (non sea food) or should I just pass? Thanks!!!!! Sara, you could use any other kind of meat. Chicken would be the obvious choice, but the serving size might change, and the points too, depending on what you choose. I might even try beef… Marinate it in lime juice, olive oil, chili powder, cumin and pepper. Then either stir fry it, or grill it, and add it in small pieces. Then it would be more of a Fajita salad! Yummm! Ewww, beef in this fresh dish? How about roasted tofu? I think beef would work. I would slice cold steak done medium into bed fine strips and maybe marinate it in some Chipotle seasoning before grilling. I would use shrimp or imitation crab meat instead. I have made this with lobster just another choice or maybe chunk salmon. Lobster, seared monkfish, or shrimp can replace crab. Use the best quality possible. Ewwww…. Tofu you just ruined the dish! Not my thing, but if you enjoy that, why not? Crab is the main part. Just skip this recipe and look for something else…..
love! I've made a similar dish one time and served it in the avocado "shell"